Metal is the go-to solution for all things visual in swift. Learn how to use it to impress your friends with cool visualizations. Or at least learn more about metal and swift. Inspired by this tweet from Erwin Santacruz, the owner of http://houdinitricks.com, I thought it was high time that I played with some strange attractors in Swift. 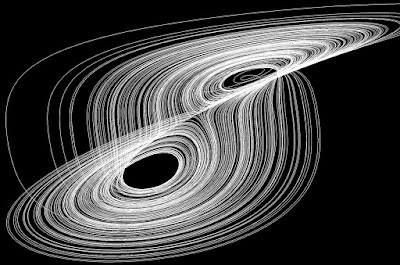 Strange attractors are equations that represent behavior in a chaotic system and one of the most famous is the Lorenz Attractor which is a simplified model of atmospheric convection. This task is ideally suited to Metal, where individual points can be calculated and rendered super quickly. Although the points are three-dimensional, I decided to stick with a compute shader and render to a two-dimensional texture using my own faux-3D approach. The fundaments of the structure aren't a million miles away from my previous experiments with particle systems under Metal. The project begins with what is effectively an array 222 or 4,194, 304 in size. The first item of this array is given a vector of three random floating point values. Inside the Metal compute shader, an index defines which point, or item in the array, needs to be calculated next using the formula above. The index is incremented with each step. The final project is available here–enjoy! For some stunningly rendered strange attractors with accompanying maths, check out Strange Attractors on Behance.